Welcome to the third edition of the ‘How I Put My Type 2 Diabetes Into Remission’ series. 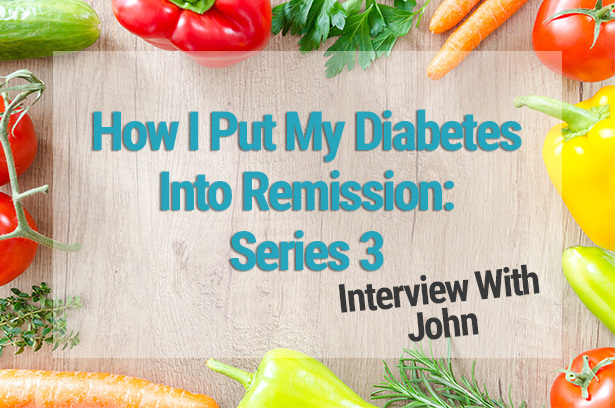 Today, we will be talking to John, who discusses his experience of type 2 diabetes and how he put it into remission. Hi John, can you tell us a bit about you and your diagnosis with type 2 diabetes? When I was a young boy I watched my great uncle lose both his legs after an in-grown toenail became infected. He was a fit and healthy 83-year-old, having been a sheep farmer all his working life, walking many miles around the peak district each day, long before farmers had quad bikes. He only had diabetes for a couple of years. My mother was diagnosed soon after he died, she was cuddly, like Hattie Jacques from the old “carry on films”, but always active. She followed the new (in the ‘80s) department of health, healthy diet and had no control of her diabetes, needing insulin within a few months of diagnosis. By the time she was in her late 50’s, she was visually impaired, in her 60’s she was taking insulin twice daily and more than 40 pills per day. At 71 she died, having had multiple amputations in the previous few months. I was called by the hospital ward a few minutes before she died, but couldn’t get to her in time, I live 60 miles away. I don’t think I’ll ever forgive myself for that. A few weeks before she died she asked me to lose weight again, I’d gained 50kg in the previous 6 years, having stopped weight lifting and running, she was worried that I “would end up like her”. I didn’t listen. After mum died I threw myself into my work, I had a new job setting up a new NHS service. However on Friday after finishing for the weekend I would hit the pub, all day Saturday was spent in the pub and I’d have Sunday lunch there too. By grand national weekend in April 2012 I was 150kg at only 5ft 9 (and a ¼). We went to Aintree for the weekend and in the hotel in the evenings I had a strange urge to drink cider- I’d never touched cider in over 30 years of frequenting bars. Back home on Sunday, I was in agony with an awful headache, I felt very weird. On Monday my headache was still present and I convinced my wife that I needed “checking out”. I told her I thought I may have diabetes and my glucose was high. The GP wouldn’t see me, and due to an IT glitch, they had discharged me! A&E was my only option- embarrassing because my wife works there. They checked my glucose and it was 27, I cried, I’d let my Mum down. A fat man laying on a trolley crying is not a pretty sight, though my wife’s colleagues were understanding. I went home and got an appointment with the GP who started me on metformin and referred me to their diabetes Dr. Eight weeks later I attended the GP’s “diabetes clinic”, greeted by the practice nurse, she started with the comment “Now then love, you’ve been diagnosed with diabetes, you’ve probably heard that diabetics lose their feet, but don’t worry, that doesn’t happen these days”. I was shocked, I pointed out that my mother had just had multiple amputations and had “F______ died!” and there’s a ward full of people losing limbs at the local hospital right now! My wife squeezed my hand. After this debacle I was sent upstairs to the Dr. She told me “diabetes is a lifelong progressive disease” (this was from the NICE guideline which I’d read) she went on to say “don’t you worry, I’m going to bash that pancreas and hammer that liver and you probably won’t need any insulin for about 10 years, but after about 20 years you will have major complications”. I told her I was worried, my mother had just “died of diabetes”, she laughed and went on “you don’t die of diabetes, you die of the complications”. I came back sharply with “she wouldn’t have had the F______ complications if she didn’t have F______ diabetes would she!”. The Dr resorted to looking at my HbA1c results, she didn’t believe them, so she rang the lab and they were correct. My HbA1c had come down from 17.9 to 5.6 in less than 9 weeks- during which I had lost 22kg. She congratulated me, said she had never seen anything like it and I must be very sensitive to metformin! I changed my GP practice as I thought this must be a one-off. My glucose crept back up over the next couple of years, as did my weight. I had the idea it wasn’t worth trying, I had a disease which according to NICE is lifelong and progressive. There is no cure and it reduced life expectancy by around 13 years. Then we got pregnant! My little girl was born in March 2015, her big brother and sister were 23 and 24 years old. I was happy one minute but then sad the next, thinking I probably wouldn’t see her into adulthood. In Summer 2016 we were cuddling on the settee when “the one show” came on the TV, they talked about Professor Taylor’s studies at Newcastle. Suddenly I had some hope. Next day I talked to the diabetes nurses at work and they had never heard of it, they said it was nonsense. I went to look at Professor Taylor’s website anyway, and read the lot. At the start of September 2016 I started my 8 week 800 calorie per day diet, stopping metformin on day one. 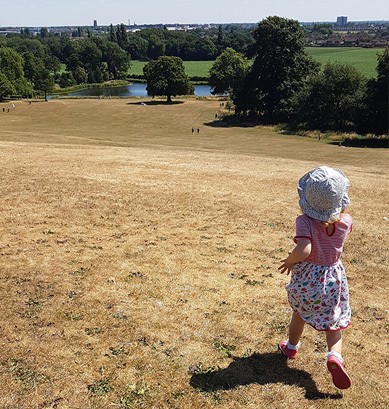 It wasn’t just about losing weight, it was about reversing diabetes and giving me a better chance of seeing my little girl settled into adult life. Perhaps there was even a chance that one day in the distant future I could drop dead with both legs in tact. The diet was easy after the first day, during which I felt hungry. I also went back to my gym, though I was weak after a few weeks at 800 calories. After the 8 weeks I had lost 30 kg and when looking back at the Newcastle website I noticed that they were now taking some patients to 20 weeks at 800 calories. I decided I was going to do that. After 20 weeks I had lost 50 kg. My HbA1c was 37. I could hardly lift anything in the gym and realised I had lost lots of muscle mass along with the fat. I had probably gone on too long. I had no support from the NHS. Colleagues told me I was damaging myself and criticised me throughout the diet. My GP practice nurse, I’d never met the Dr, rang me after the HbA1c was measured at 37 and asked me how I’d brought it down so quickly. I told her I had used professor Taylor’s diabetes reversal diet, and she said “Diabetes isn’t reversible”. I measured my blood glucose from diagnosis, buying my own meter and sticks as they are not supplied by GP’s locally and the diabetes nurses criticised me for doing so. On the 800 calorie diet, fasting glucose was 4.1-4.3 within 1 week of starting the diet. Fasting glucose one week, HbA1c lags behind and wasn’t measured until about 4 months after starting the diet. It was 37 by then. After the diet I regained 15 kg, my colleagues all think that I’m heading back to where I started, but I’m still 35 kg down. My waist is 18 inches smaller. My HbA1c is still 37. I struggle at times dealing with comments from colleagues and I’m angry that the NHS, who I’ve spent 30 years working for, does not have either a local or national diabetes reversal strategy. Every GP practice should have a diabetes reversal nurse and I am in the process of challenging those in charge to ensure this happens locally. I’m not very popular because of this. Do you stick to a specific carb limit? If so, how many carbs would you say you eat per meal or for snacks? For the last couple of months I’ve been low carb high fat. I’m having about 2000 calories per day with about 35g carbs per day. It’s easy to do and track. I recommend people read the 8 Week Blood Sugar Diet by Michael Moseley, but for long term health I recommend The Pioppi Diet by Dr Aseem Malhotra. Can you give us examples of what types of meals you eat for breakfast, lunch or dinner? Scrambled eggs for breakfast at weekends. I don’t have breakfast on weekdays. Lunch at work could be scrambled eggs, or may be a home made foo yung, some olives, and almonds. Sometimes I’ll have a Greek salad or a meze of fish with some squid, prawns, scallops drizzled in a 50:50 mix of lemon juice and olive oil. Dinner last night was a Greek salad (cucumber, tomato, onions, feta, halloumi, chicken breast, ¼ pounder- no bun, all drizzled in olive oil, with a few macadamia nuts and almonds for a snack whilst watching a movie). 23 (and a bit ) months in remission now, though the practice nurse and diabetes nurses locally say that remission isn’t possible. Challenges really are trying to get the NHS to wake up to the fact that this is possible. Go for rapid weight loss to clear liver fats, as described by Professor Taylor. Ensure you discuss your drugs with your Dr prior to doing so as you may need to stop some of them. After losing the weight, go to a low carb high fat diet, read Dr Malhotra’s book listed above to understand why. Have a look at “mindfulness meditation” free videos on YouTube. Jon Kabat-Zin is best. I laughed when it was suggested to me, but it’s changed my life and I’m now much more able to clear my mind of all the nonsense. Recognise that health professionals are advising you, but it is your body and you must take control of it. You really can do it. I would like to thank John for his time, for sharing his story, and his honesty. Although some doctors and nurses are coming round to the fact that type 2 diabetes can be controlled with diet, it is still a very slow process. Many of you reading this may have had similar experience to John, I know I have. Regardless, John has not let this deter him and has achieved fantastic results. Showing us all that it can be done! 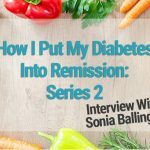 Did you miss the second edition of the ‘How I Put My Type 2 Diabetes Into Remission’ series with Sonia Ballinger? You can read Sonia’s story here.